This spring marked my 10th year working as Creative Director at Rosepapa Creative. Each year I like to take a few minutes, walk down memory lane and look back over the past year or in this case the last several years. The digital media field is a challenging one. It’s constantly evolving, competitive and unpredictable. However that’s what keeps the journey interesting! Over the years I’ve worked with dozens and dozens of small business owners and know their challenges, pains and frustrations. I have many stories; from the strangest of startups to the most common. However the common denominator with most business owners is the enthusiasm and passion they have for their product/service. They believe they ‘can’. 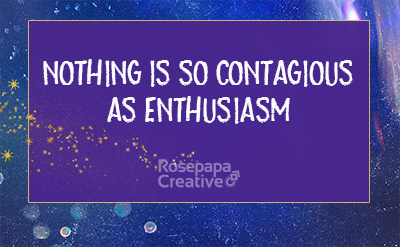 And that ‘can’ and enthusiasm is contagious. I enjoy being part of that journey. Looking back over my last 10 years, I call this the start since that is when I became ‘official’ by setting up the LLC for Rosepapa Creative. However, I was in the web and graphic design business way back. Speaking of way back, I actually had to dig back into the web archives to pull up a few of my first projects from 2004, which by today’s standards is quite outdated. 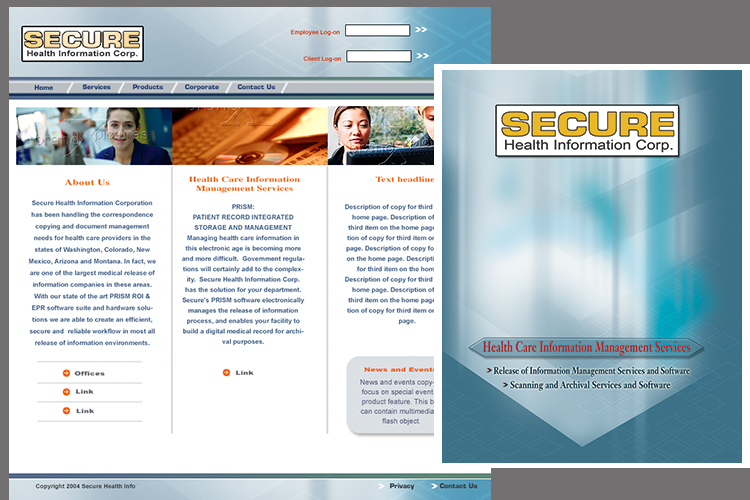 In 2004, I had just completed an advanced multimedia certification program at the University of Washington and this was one of the first websites and branding projects that I designed for an Information Management Health Care company in Seattle. In 2005, one of the first eCommerce websites I built for a new company VinMaps… scroll down to read what happens 10 years later! When I started in the design field I was a small minority of women in the workplace. I started my career right out of college with a BA degree in Liberal Arts. I worked as a designer in desktop publishing for a large book publisher in California. Fast forward and a lot of experience in print and publishing and the evolution into web design and digital media, married with 3 kids. With 3 kids at home I wanted a career that would give me flexibility for time with the kids. My skills and experience took me several places one of which was Infusionsoft. At Infusionsoft in 2006 – 2008, I built several websites, designed many marketing campaigns, created dozens of landing pages and went through 3 re-branding projects. Look how outdated this looks! Back then it was a big deal. After spending a couple years at Infusionsoft, I learned extensively about Online and promotional marketing and gained a lot of experience. I wanted to go out on my own for more flexibility in my schedule. And I caught that entrepreneurial passion bug. 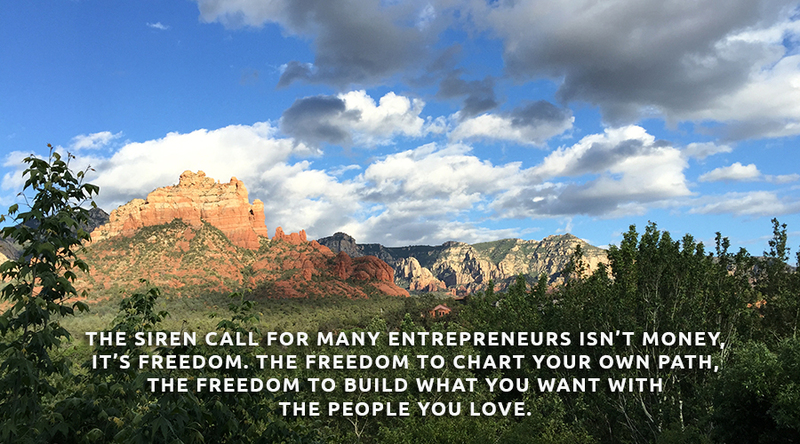 Misconception- who said being an entrepreneur meant more time? This is when I started Rosepapa Creative. Over the years I’ve worked with a variety of service based businesses. Some businesses for only a month and others for years. I’ve also built a good support network Online which has been great. I’ve developed partnerships with developers, agencies and referral partners in order to keep moving my business moving forward. I also continue my education and training frequently to keep up with changing technologies and trends. Being involved with my local chamber of commerce and ‘leads’ groups has helped me get a foothold. But it hasn’t been easy. When I started my business it was when the economy took a nose dive. I look back and wonder from time to time why am I still doing this? I love design and I’m also an artist. Marketing is exciting and the opportunity to be a part of something bigger is rewarding. However what really stands apart are the people that I work with. The people I work with inspire me. The clients I’ve worked with over the years and the relationships I’ve built are the best part of my business! It’s very rewarding to solve problems together and create something lasting. I enjoy the competitive piece of doing everything within my experience and abilities to make my clients the best at what they offer. Going the distance, I realize the quality of work we offer of course is important (quality and skill is the entry point into the creative field). But it’s more than that. It’s the experience, genuine caring, being supportive and tenacious. I don’t give up easy. And I don’t give up on the people I work with. My goal is to make them look amazing. 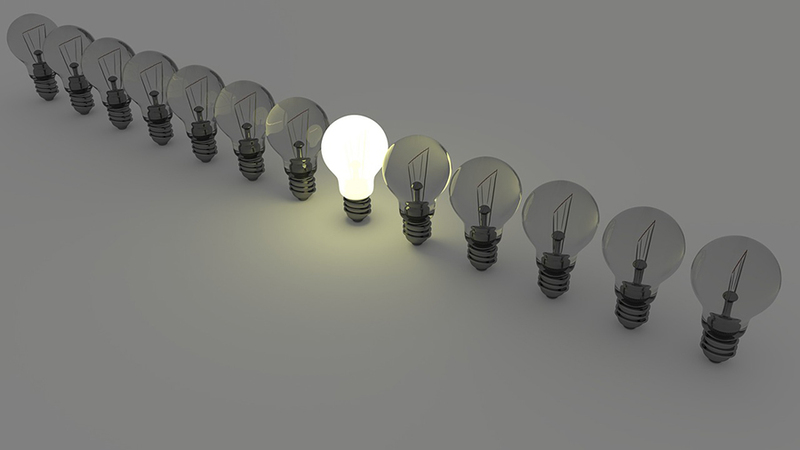 I want our clients front and center in the spotlight. 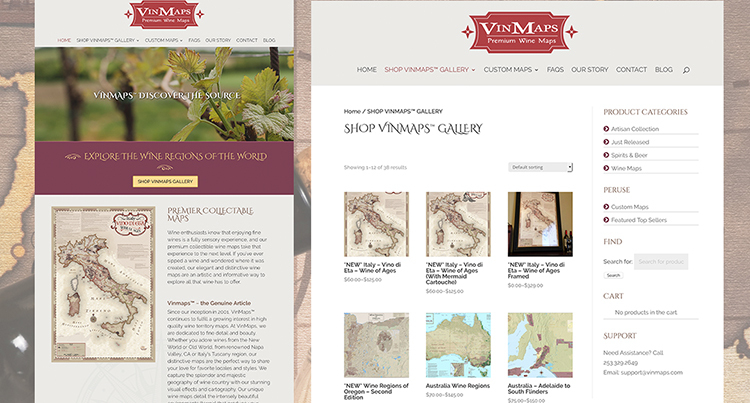 VinMaps® eCommerce website. 10 years after I built their first one! 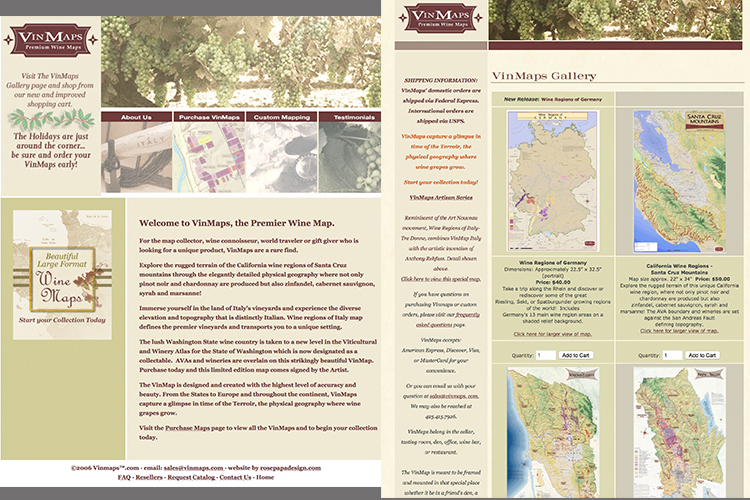 I’ve created all the branding for VinMaps and continue to work with them on marketing today! My kids are in college and one has married. However, this hasn’t changed – My why is still about the purpose of my work which is to empower business owners through creative design and marketing. Design styles and technology will always change, but having a strong foundation, the knowledge and winning attitude always goes the distance.